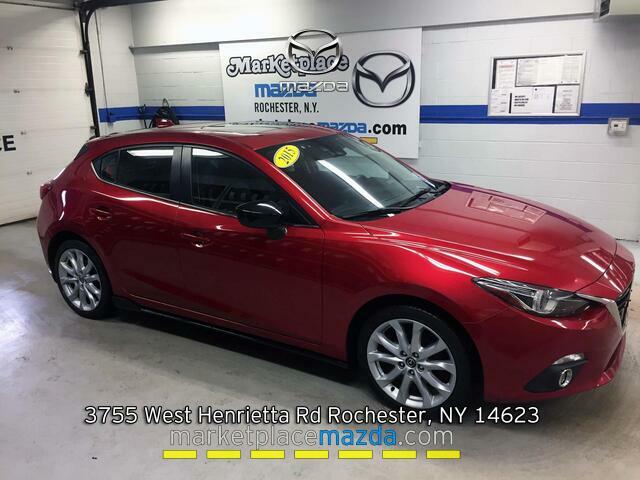 *One Owner, Clean CarFax, Moonroof, Remote Start, Navigation, Backup Camera, Heated Seats, Lane Departure Warning, Blind Spot Monitoring, Steering Wheel Audio & Phone Controls, Cruise Control, Cargo Cover, Fog Lamps, Alloy Wheels* Mint 2015 Mazda3 S Grand Touring! The Moonroof provides excellent views and a nice breeze! Back Up safely with the included Reverse Camera! Change lanes with confidence with the Mazda3's Blind Spot Monitoring System! Remote Start & Heated Seats are a lifesaver especially in the cold of winter! Steering Wheel Audio & Phone Controls allow you you to change a station or answer a call without having to take your hands off the wheel! The included Navigation System ensures you never get lost again! Have Questions? My name is Taylor please contact me directly at (585) 797-3282 to confirm availability as multiple vehicles are sold daily.